Did you know that the average person consumes around 6,000 calories on Super Bowl Sunday? That’s almost two pounds of additional body-weight in one day! So what can we do? Healthy living is all about moderation, so let’s make sure that we have some strategies in place for you to enjoy the game time munchies without going overboard. This way, you won’t be famished. Enjoy a breakfast with protein, healthy fat, whole grains and fiber. A lunch packed with veggies, protein and healthy fat, and maybe even a small salad, or cup of veggie or lentil soup, before the festivities begin. Get to the Y before the game and move your body. Take a class, ride a bike, walk, or swim laps. Just move and start to perspire a bit. Hydrate throughout the day and have a glass of water after any other beverage during the big game. Do you love nachos and pizza? Are wings your favorite? Decide ahead of time which snacks you will enjoy (in moderation) and which you can have another time. If certain drinks give you the munchies, make a deal to only have that drink when you are away from food, or after you have served yourself a portion of your favorite snack. This seems simple, but grazing without a plate does not give you the visual cue of how much you have consumed. Imagine how it feels to wake up the day after a high sodium, high fat meal. Bloated, sluggish, sometimes even irritable. Do you want to wake up on Monday feeling that way? Or would you prefer the satisfaction of success after indulging in favorite snacks, but not over doing it? The choices you make on Sunday will determine your post game day success! Every commercial, find your glass of water and take 30 seconds to come back to your ultimate goal of living a healthy lifestyle. At halftime, take a look at the stars outside and imagine how good you will feel knowing that you had a plan and made it happen. Serve, or bring your own fresh veggies with hummus, fresh fruit, and choose baked over fried whenever possible. It’s the big game! Want a wing? Have it. But be calculated and SMART (Specific, Measurable, Achievable, Realistic, Timely) about your choices. Maybe have two wings in the first quarter, then two in the third quarter. Have fun, choose wisely and game on! 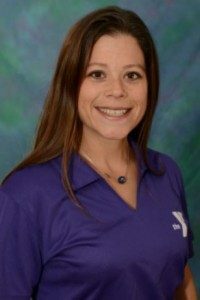 Allison has been a YMCA staff member since 2006, beginning at the Glenville YMCA, moving to the Greenbush team in 2014 and landing back in her hometown Southern Saratoga YMCA in 2016. Allison is a American Council on Exercise certified Health Coach, Certified Personal Trainer, Weight Management Specialist who is also certified with YMCA of the USA, YogaFit and SPINNING. Allison enjoys helping clients achieve their goals and encourages them to continually strive for their personal best. She specializes in working with clients to gain strength and achieve weight management. Ask Allison for help with weight management, fitness for the busy lifestyle, and strength training.